Main card page: "Salamangreat Roar"
When a Spell/Trap Card, or monster effect, is activated while you control a "Salamangreat" Link Monster: Negate the activation, and if you do, destroy that card. 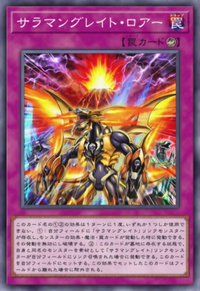 While this card is in the GY, if a "Salamangreat" Link Monster is Link Summoned to your field using a monster with its same name as material: You can Set this card, but banish it when it leaves the field. You can only use 1 "Salamangreat Roar" effect per turn, and only once that turn.